3 Janes, a few others, no Jacks. “No one knows you here, do they?” states Amanda with all the alacrity of a well-adjusted recently-turned 8 year old. “Most certainly not,” I reply, walking her uphill to her new school. “It’s not like in Brisbane where everyone knows you, is it?” she says, rubbing it in further. Around South Brisbane and West End, I can’t go two paces without running into someone I am acquainted with. Here, not counting my former secondary school classmates, one of whom I am told lives in a neighbouring suburb, I know just a handful of people. God, deciding I need a break from remembering a host of bothersome details – address, phone number, several alien dos and don’ts – has chosen to give me 3 new mates with the same name: Jane. Jane number 1 owns the health food store across from where I live. Unfortunately, I’ve not seen her since I moved in because she went back to Singapore for the Chinese New Year. I’ve seen plenty of her husband though, running her shop in her absence, who’s evidently a fan of Colin Barnett, Western Australia’s premier. Jane number 2 I met while having sushi on a Friday night with the family. Her partner, Keith, was keen to rope Amanda in as his newest germ busting Ambassador for Children’s Global Hygiene Foundation, a not-for-profit initiative which aims to stop the spread of disease in third world countries through the provision of hygiene systems, soap and education programmes, in partnership with various organisations. Jane number 2 teaches deaf children, unfortunately for me too, full time. Jane number 3 is the mum of one of Amanda’s new classmates, who invited us both over for tea last week. Her kid and mine get along so well, there’s talk that we might have tea again, perhaps even at my house, which at this point only has 3 mugs! Since I was already there, I got to know Kelly, Jian, another Chinese lady whose name I didn’t quite catch and “The Arab” as well. Jian had Amanda and myself over for tea last Friday and by the time we reached home, HRH had long returned from work by braving an uncharacteristic Perth downpour. Kelly has to send her husband to work after school drop offs, so we can only catch up during the afternoon pickups. I met Lilian frequenting her cybercafe to write posts this past month. We’ve become such great buddies she gave me a $0.30 discount on my internet session after a rustle through my handbag failed to turn up enough for another half hour. What can I tell ya? It’s the end of the month, folks! I met up with 2 of my former secondary school class mates on the weekend. One brought along her sister, 5 years our junior, who attended our school after we left. Despite the long years of not meeting – I was told it was 18 and not 20, proof that my maths is still as bad as before – we had much to say to each other; even though the other 3 are footloose and fancy free, high-powered career-women, they were happy allow me a protracted monologue on the joys and pains of motherhood. Which brings me to the subject of friendships: do all friendships last forever or is there a time-limit on them? Am I one of the lucky few who can count people I met as a 12 year old as friends or is this an occurence experienced by many? What I like best about friendships made during my schooling years, and equally those formed at university, is that they have endured tremendous neglect, vast distances and a myriad of circumstances that contrive to keep people apart. By contrast, some of my newer friendships have not survived probing emails (I hate being the recipient of such emails, especially from mere acquaintances), the odd tiff about things as trivial as not calling them (even gregarious people need time out from socialising) or just plain ignoring them (trust me, there’s a story to that). I like that my friends from school and university know my other friends from school and university so no matter how awkward it gets between us, neither of us ever “unfriends” the other. We might contemplate it after a misunderstanding or two, but belonging to a herd supercedes the need to be right; more so as we age and realise, selfishly or narcissistically, that these are the very same people who will remember us even after we forget ourselves as our story is so intertwined with their glory days that they can’t possibly retell theirs without telling ours. As we get older, there will be more and more of those, “Do you remember when…?” type conversations. We’ll reminisce about youthful bodies and all the silly things we could have done when we were young. And we’ll swap remedies for the occasional post-adolescent acne, unfortunately permanent wrinkles, and stubborn pot bellies from too many snacks taken while checking facebook to see what everyone is doing. Of course, that’s not to say that all will remain friends. But I’ve found a friend in school, secondary or tertiary, is generally a friend for life. Aside from the number of people whose affections we share, we’ve just too much shared history to walk away from the relationship. P/s I do make many NEW friends whose acquaintance I hope will grow into genuine friendship, but the number that make the leap from stranger to bosom buddy is rather small. Having said that, I hope that with time and the writing of this blog, my odds of making NEW enduring friendships will improve. Stop the shooting of strays, support Noah’s Ark (NANAS). A quick question: would you help or shoot a homeless person? This seems like a no-brainer, the answer obvious even to the most simple-minded among us, but why is it all right then to shoot stray dogs like they do in Malaysia? The 2 dogs involved – “young men” my mother called them – were rough-housing with each other and being dogs, didn’t understand that you have to be careful around brittled-boned old ladies. She believes it wasn’t their intention to hurt her. “I think they knew they did something wrong because they came around after that and put their heads down low near the gate, as if to say sorry,” she said. Not all are strays. Some belong to her neighbours; people who neither feed, neuter, de-worm or buy dog licenses to keep their dogs. Unfortunately there are many such people out there who claim to love animals, their pets at any rate, but deem the paltry yearly license-fee that will keep their dogs safe from council-appointed dog shooters, unnecessary. Noah Ark’s has been lobbying the government of Malaysia to amend its laws on stray dogs. As already mentioned, under prevailing legislation, all dogs spotted without licenses are shot dead by council workers appointed to carry out the gruesome task. In Australia, strays are rounded up and sent to the RSPCA where they will be cleaned, fed, spayed, and put up for adoption; putting down an animal only being a last resort. Strays may have already passed the “cute stage” but so do a lot of human beings and we don’t shoot them! They make more loyal, devoted, easy-to-care-for pets than thousands of dollars to buy and maintain pedigrees, some of which still end up on the road when their owners tire of them. Many strays make excellent guard dogs and almost none are choosy about their food (more than you can say for human beings). If there is a chance that the answer may be No, don’t risk allowing another dog to end up on the road as certain death awaits it at the hands of dog shooters. To support the provision of a humane retirement for strays – cats, dogs and the rest of Old Macdonald’s farm – please make a donation to Noah’s Ark. Noah’s Ark also welcomes the sponsorship of individual animals in their care. P/s Noah’s Ark didn’t ask me to write this and no, I haven’t received money to do so. Almost anthem-like, and from my experience far more prevalent in Australia than in Asia, are protestations that life is NOT fair, accompanied by the metaphorical chest beating. In my own home, I have heard this very same turn of phrase – “But it’s NOT fair” – uttered not once, not twice but innumerable times, most often from my 8 year old, who uses it as a shield to deflect from my pointed questions about her performance at school. “No,” she’d say with slumped shoulders. “But Mrs. X says I am her best drama student,” she’d say, her face brightening. Lily single-handedly won their class an outing to the water park when they were in grade 1 by raising a couple of thousand dollars for the school through the P&C’ s annual readathon. I meant to enrol Amanda but forgot to submit the form. “Not as many. TV is just more interesting,” she says, her shoulders now the same level as her waist. “No, it wouldn’t,” she says quietly. I’m pleased she can see the logic in expecting only what you put in. It’s a really simple equation but even many adults don’t get it. Take for instance this lady working at a boutique where I was attempting to get an exchange on something I bought because it didn’t fit me. “It turns out I wear XS instead of S,” I said to her. Yes, I am relatively thin but I am that way because I watch what I eat, exercise and am constantly berated by my mother when I pile on a pound or ten. So what is the unfair part? Yes, I do have a husband who provides me with a relatively comfortable life. Again, everything is relative. But are you around to see me eating bread and vegemite when everyone else is having their abalone and sharksfin, surrounded by family, for their Chinese New Year reunion dinners? Are you sitting with me in the dark, in the hospital parking lot, as I wait for hours on end for HRH to finish up on patients? So again, what is unfair about this? I don’t look at my corporate warrior friends and say, “Gee, life is unfair, don’t they have it all?” because life is fair and they don’t have it all. No one does. The Stay-At-Home Mums (SAHM) envy The Full-Time-Working Mums (FTWM) for being able to socialise with other adults and drawing monthly incomes. The FTWM envy the SAHM for the extra time they have with their kids – the leisurely drops offs and pick ups, being able to take care of the littlies when they are sick. Single folks of a certain age envy their married peers, whilst married folks, trying to juggle a partner, work, kids and in-laws, envy the freedom and lack of compromise of their single peers. Some of us have more than others, that’s true, but no one has absolutely everything: not youth and money, or youth, time and money, or any other truly enviable combination. I put it to you hypothetically: if life is truly unfair and they get handed all their lucky breaks on a plate, why is it they still have marital breakdowns, physical breakdowns, jump off a bridge or what have you? “But what about those who are born with a silver spoon in their mouths? As in born rich and beautiful?” you ask. Go ask them how much time they got to spend with their fathers or mothers or whoever was providing them with that silver spoon. Unless you shop at Salvo stores, silver spoons don’t come cheap, which just goes to show you that life is fair. No one has everything. As for beauty, apart from it being in the eye of the beholder, your mum or dad could have chosen to mate to anyone they wanted, so who are you to complain about not being Miss Universe? We only think life is unfair because we don’t know the FULL STORY on everyone else’s lives. If we did, then the collective moaning and groaning would give way to a chorus of gratitude for the gifts and life we’ve been given. Of that I’m most certain. Hello Perth (aka finding a place to stay). Right. So I’ve gone and done the whole Magic Monkey thing of journeying to the West. What do I do next? I look for a place to stay of course! Months prior to coming here, HRH and I had already begun surveying the rental market. We knew that we’d be paying an arm and a leg, competing with students of nearby University of Western Australia for a place to stay near enough to HRH’s new workplace. We’d set ourselves a budget, bearing in mind we’d need money for food, furniture and to service our existing mortgages because last I checked, I didn’t have a spare organ to sell. But browsing the for-rent pages of Perth over the internet is very different to actually being here in person yourself. For one, some, not all, real estate agents will get back to you on your voice-message enquiry about listed properties. Don’t even think about emailing them because as I’ve discovered, email is so last century; no one checks their email anymore. Or if they do, no one responds. You have to be here in Perth, in person, to hound them! But don’t hound them too much. That’s what I did when I applied for my first property here: I called every hour on the hour because I was DESPERATE to have a lease in order to enrol Amanda into school. I don’t know about elsewhere but schools in Perth’s affluent Western Suburbs only take children in their predetermined Local Intake Area (LIA). So if your place falls outside the boundaries of the LIA, they might take your child on a case-by-case basis but be warned: if enrolments go above the school’s desired number of students, your child will be asked to leave! After we failed to get the first property we applied for – a 6 year old minimalist shoebox zoned to a school where my child might get put into a class with students a grade down from her, a split class, as the school has inadequate students for that year to form another class – I decided to go for a much older property in another Western Suburb. I figured mother’s maxim of “old man’s honey and young man’s slave” must also apply to real estate so I applied for a property that looked like a dog’s breakfast in photos. Frankly, it was my third, if not fourth choice. However, I’m pleased to tell you it was the right choice because for a start, my realtor is approachable and easy-going, instead of one of those manicured, stilettoed and power-suit wearing people who get pissed off just because you haven’t given them a full 24 hours to check with the owner of the property – as though you need a full 24 hours when presented with applicants as good as us: mature, employed, non- smoking, home-owners. This other area I’ve ended up renting in also has significantly more amenities than the first one so the rejection turned out be a blessing in disguise. We spent the first 3 days of moving into our new home for the year, getting a DIY degree from IKEA, putting together our sofa, table and 5 dining chairs. I called Telstra on the fourth day to connect our home phone and broadband since we still have an account with them. They gave me a 3-week waiting period for the home phone and a 4-week waiting period for the broadband. When HRH called to ask them if they can speed up either, Telstra said they can’t, not even by a couple of days. 5 things you need to know about driving across Australia. 1) Petrol stations aren’t everywhere. In fact, as you go through the outback, you might only see what Aussies call a “servo”, as in service station, every 100 kilmetres or so. Therefore if your fuel light’s a-flashin’, I suggest you get a-pumpin’ at the nearest servo, regardless of the price. The difference in the price of petrol between capital cities and country towns can be as much as 15 cents a litre, but across the Nullabor – actually anywhere from after Port Augusta in South Australia, to 200 km outside of Norseman in Western Australia – petrol can be as dear as $1.97 a litre. That’s in AUD, folks. 2) Car service stations can be found in most small towns. Still on the car: if you should say hit a kangaroo or get into any car trouble along the way, you can always find a workshop at the small town nearest to you. They typically have a towing facility, although I’d say that if you need towing, you’re probably in no shape to continue with the road trip as a drive like the one we’ve undertaken is arduous. We drive a Toyota and through the many small towns we’ve been, we’ve always seen a Toyota service station. Places like Toowomba and Port Augusta, obviously the “bigger small towns” have workshops for other brands of vehicles too. Eucla had a mechanis who quite cleverly put a sign saying “NO RAC.” Meaning, your automotive club membership probably doesn’t cover these parts. Now please don’t expect chef-quality tucker while barreling across Australia’s dusty backyard. If you do, you’ll be in for the sort of surprise Weigh Watchers and Jenny Craig charge its members for: as in you’re gonna starve from all those skipped meals. If you are health and weight conscious like me, and into rice like HRH, the best thing to do to appease your fastidious taste buds is to stock up on fruit at a supermarket before you set off and when passing through any town with a supermarket – some towns only have a petrol pump and a motel. Do please remember to throw away any fruit BEFORE entering South Australia or Western Australia as on-the-spot fines of $200 applies to anyone found transporting fruit into either states. You may expect restaurant meals to cost between 15 and 50% more than in Australia’s capital cities. The handful of groceries you can get at places like Eucla are twice what they are in a capital city. The typical truckstop along the way only serves fried food like fish and chips, chiko rolls, and bangers and mash. Once in a way, you will find one that makes salad sandwiches (not salad), but be prepared to pay in the vicinity of $6.90 for two slices of bread with two slices of tomato, some shredded lettuce and a slice of beetroot in the middle. 4) A clean bed is a good bed. Again, it pays to have reasonable expectations when it comes to somewhere to rest your weary head for the night. Many places claim to be “hotels” but they aren’t hotels in the regular sense of the word. Some are highly liveable serviced apartments, many are clean, tidy motels, many still are just rooms with a bed and a TV. We paid an average of $150 a night; in every instance we stayed at either the best or second best accomodation available. There were certainly many others on our route who decided that camping was more their style and they saved a tidy bundle in accommodation that way. 5) There is no network between Eucla and Norseman. Yup. You might as well forget about being contactable because Telstra doesn’t reach these parts. I dare say it doesn’t cover other parts of outback Australia either. While we were passing through the area, a couple of thousands of kilometres long, we had no signal on our phones; no signal also means no internet. It was good though; being uncontactable is rare in this modern world so we relished just having some time to ourselves. The day I’ve been dreading has finally arrived. Today we have to put in 8 solid hours of driving before we can stop for the night. Including lunch and toilet breaks, our trip from Eucla to Norseman will take us 10 hours. Yes, 10 hours. If I take over the wheel at any point, which is likely, to give HRH a break, it’ll take us longer. ” I sail lonely as a cloud…” A picture of the landscape leading away from Eucla towards Norseman, Western Australia. As we move further into Western Australia, you can see how arid the land is. You know how people love to joke about eating grass? As in, “I’ll live off grass and sunshine?” Well, you’d better ditch your plans to dine on the green stuff because there is close to none of it around. The only plants that thrive in this part of the world are those that are heat and drought-resistant. See how short the shrubs are? “That’s what happens when plants have no water,” I say to Amanda. “Go tiger, go!” cheers Amanda from the back, well aware that our car is the tiger and every other car in front of us is a deer. Can you eat any of this? Sure, if you’re a donkey! “Sure,” I reply, somewhat amused. Yesterday, his road-driving-inspired idea was for all suicidal people to be shipped to Mars because if they are intent on ending their lives, they might as well contribute to humanity before doing so. Perhaps, suddenly having a purpose to live might make them change their minds. “People from China of course,” he says with a wry smile. Don’t the trees look interesting? As you can see, the top most foliage of every tree over a certain height in the area has dried up and fallen off. We might moan about the traffic jams and the smog, and the noise and the price of housing and the cost of living, but given a choice between a big city and the countryside, most Chinese will choose the former. In fact, no one in my family can understand why we are undertaking this road-trip when there is absolutely no one to see for hundreds of kilometres on end! HRH stops at a small roadside town called Baladonia to refuel the car. The price of petrol is $1.97 a litre. He pumps only enough to get us to Norseman – very many litres. A picture of a summary of the route we are taking from Eucla to Norseman on the side of a building at Baladonia. Why I’ll be damned! After so many hours of travelling, we still have another 191 km to go! Somewhere in the middle of nowhere, we swop seats and I drive for about an hour. It’s only my second time behind the wheel since this arduous road-trip, disguised as a “family holiday”, began but already my driving has improved. For a start, I don’t need any reminding to lift up the hand brake before taking off. HRH’s barking at me when I attempted to do that the last time has seen to that. Oh Norseman, oh Norseman, where art thou? The endless straight road in front of me makes me think of Char Koay Teow and a nice big bowl of Chendol. Will I ever see either again or will this drive be the death of me? Soon enough I see the outline of a vehicle, roughly 10 km ahead of mine. I am doing a steady 110 km/ph but I slow to 100 km/ph. “What do you think you are doing?” asks HRH. “Probably nowhere. Well, you did want me to drive. I’m not going to overtake,” I say, losing speed further. Now I’m doing 90 km/ph. HRH shakes his head. We pass through a small town where there is a police vehicle hiding in the bushes. Afraid of overtaking, law-abiding citizen that I am, our tiger is only doing 60 km/ph at this point. I heave a sigh of relief when the vehicle ahead of me turns off into a caravan park. However it isn’t long before I come across other motorists. Wanting us to reach Norseman before nightfall, HRH gladly resumes driving once my hour is up. Hallelujah! It’ Norseman! 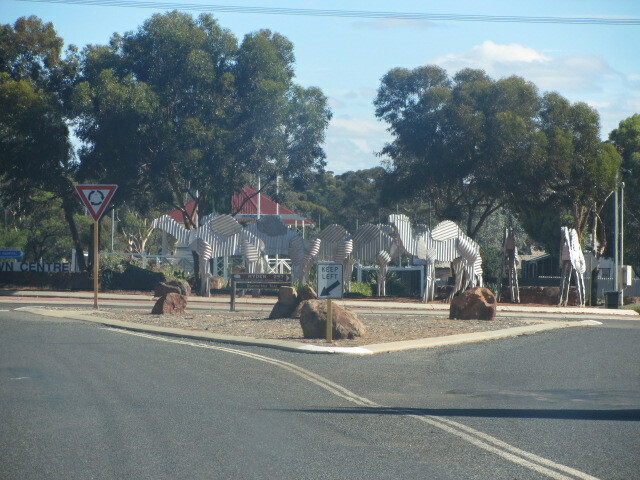 A picture of Norseman’s famous metal Camel sculptures. “Oh no. Not another 9 to 10 hours on the road,” I wail as soon as we pile into the car. By now, even HRH is over seeing Australia’s big backyard. Since we set off at 9 am, we hope to get into Perth before sun down. Just like the last couple of days, the road stretches on into the horizon. On either side of us is scrubland, alternating in heights and density every hundred kilometres or so. There is a huge metal pipe running parallel to the road, carrying what we were told by the innkeeper at Norseman Railway Motel, is Norseman’s supply of water, coming directly from Perth. From Norseman, the water is transported by road to towns like Baladonia. Can you see the end? I can’t either. A picture of the road after Norseman towards Perth. “You can tell that no vegetables will grow here,” I say, noting the hard, reddish soil. “So now you are an expert on soil, are you?” asks HRH, teasing me. 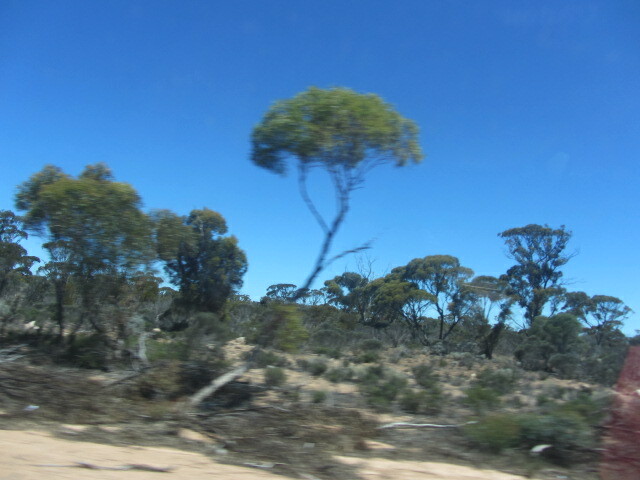 A picture of the shrubs growing along the road to Perth, just past Norseman. As we near Perth, the road widens to two-lanes on either side and snakes downhill. Unbeknown to us, we are travelling through the Perth Hills. After dragging our sorry arses through the Nullabor, any servo selling petrol for less than $1.50 is our good friend. We are somewhere on the Eastern Freeway rolling towards the Central Business District. “And see what big shopping centres they have!” exclaims HRH, like one of those people from his proposed Chinese village. I imagine this is what mainland Chinese say when they see Hong Kong for the first time. “It feels like Adelaide crossed with something else,” I say. “You and your Adelaide,” he says then accuses me of having an unjustified fixation with the capital of a state that has foul tasting water. Thanks to Tom Tom, we find our home for the next seven days, Perth’s Fraser Suites, without any difficulty. After our many days on the road, all I plan to do is veg out. Home sweet home. 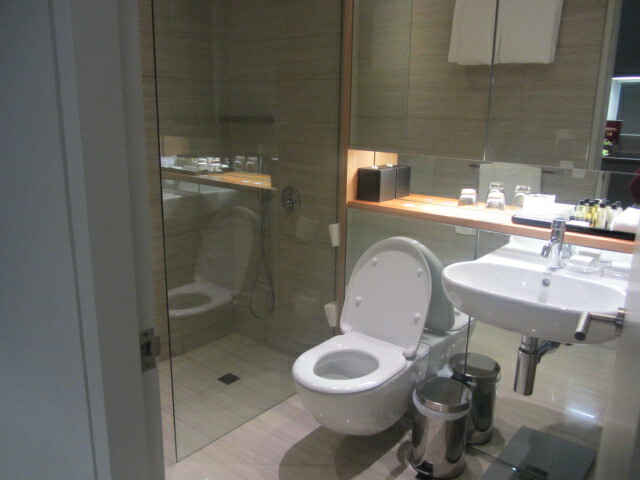 A picture of our apartment at the Fraser Suites in Perth. Now, why is a 1400km stretch of arid, definitely inhospitable, land famous? I suppose if you can survive the boredom of seeing absolutely no one and nothing for hours on end, then you can lay claim to having very good mental concentration and perhaps sign up to be a pilot or a long-distance truck driver. For everyone else there’s the rugged beauty that is outback Australia. “It’s my birthday today,” says Amanda from the back, for the umpteenth time. Trust a newly turned 8 years old to ask all the right questions. There’s no hoodwinking them with promises we adults lap up every time a general election comes around. “I’m taking you from one end of Australia to another, Amanda,” says HRH, in a tone that implies the magnitude of such an undertaking. HRH shakes his head in disbelief. From Amanda’s viewpoint, it can hardly be better since she was made to give away many of her prized possessions – clothes, ribbons, knick knacks that little girls like collecting – leave her school and say goodbye to all her friends. “People have died trying to find their way out of the desert,” says HRH. A picture of the countryside outside Port Augusta, South Australia, heading towards Ceduna. See how low the clouds hang? A picture of the road leading away from Port Augusta, South Australia. Did you say “melancholic”? I did too! While we were in Port Augusta, we heard on the news of a South Australian man who’d gotten lost in the bush. Rescue police were still out looking for him when we left. A picture of the landscape leading away from Port Augusta, South Australia. “That’s very helpful,” I say, changing the discs yet again. We can’t possibly be listening to Jay Chou another 20 times. Soon enough we come across one of those towns that seem to exist only to extort petrol-thirsty travellers like ourselves. The price at the pump is a $1.90 a litre. Across the Nullabor, petrol prices go as high as $1.97 a litre. You can either fill up your tank or be prepared to walk until your legs fall off. I know the name of this bird but have forgotten. Excuse me. I’ll let you know at a later time. A picture of a giant bird between Port Augusta, South Australia, and Ceduna. The sign says everything: we’re half way across Australia! A picture of a shop between Port Augusta, South Australia, and Ceduna. Amanda was in heaven seeing this. A picture of a locally mined gems in a shop between Port Augusta, South Australia, and Ceduna. After another hour and a half on the road, we reach our accommodation for the night, the Ceduna Foreshore Hotel and Motel. Known as the “Oyster Capital of Australia”, Ceduna boasts some good fishing and correspondingly, seriously tasty seafood; HRH and Amanda have a couple of battered banana prawns and fresh scallops and I, on my new cholesterol-lowering diet have marinated octopus for tea. Allowing our stomachs an hour of rest before the onslaught of more food, we return to our hotel room to watch Spongebob Squarepants on Nicklodeon. At dinnertime, I get a bone lodged in my throat from eating locally caught pink snapper and thus spend the next forty minutes trying to dislodge said bone by chowing down on 2 crusty bread rolls. That doesn’t work so at HRH’s advice, I have only my second coke for the last 2 years, while watching a gorgeous Ceduna sunset. Oh, and I’m still producing nose wontons. A picture of Amanda giving me attitude in Ceduna, South Australia. Now tell me that ain’t a beauty! A picture of a Ceduna, South Australia, sunset. It’s official: my nose has eloped with my make-up bag. We set off for yet another of HRH’s beloved “short drives”, this time to Eucla in Western Australia. It’s a teeny tiny dot on HRH’s travelling map, so I’m not expecting much other than a clean bed to sleep on at night. It’s another day on the road. A picture of the road leading away from Ceduna, South Australia. Where have all the animals gone? A picture of the landscape leading away from Ceduna, South Australia. I have to smell Amanda’s feet as she decides to put them up the entire way. Almost every road-train we meet on the road West is considerate of other motorists, especially smaller vehicles like ours transporting an entire family. But along comes this guy, who you can’t see because I belatedly decided to take his picture from my side-view mirror, who tries to PUSH US OFF THE ROAD when we attempt to overtake him. Before that he’d been careering from left to right. Lucky him, I hadn’t taken down his vehicle registration number if not I’d be placing a call to the relevant road transport authority. Most road-train drivers are considerate of other motorists but this one was a menace. A picture of the road train that tried to push us off the road just outside Yatala in South Australia. Since we are still celebrating Amanda’s birthday (like the Queen, her birthday goes on for a whole week), HRH detours for us to see the Great Australian Bight. Just what is a Bight? Beats me, but you are supposed to be able to spot seals, whales, sharks and other marine life when they are in season. Whale-watching season folks, is in October and November. We are many months too early and instead, only have rugged coast to admire for the bargain price of $5 per adult. Children visit for free with one paying adult. A picture of HRH lifting Amanda up to view marine life at the Great Australian Bight, Yatala, South Australia. Sorry, no animals folks. They go elsewhere to spend the summer. A picture of The Great Australian Bight. This poster tells you about the marine life visible from the Great Australian Bight. Yet more driving follows. We pass through the border of South Australia and Western Australia where we are stopped for a routine fruit-check. Just so you know: you are NOT allowed to bring fruit into South Australia or Western Australia, if travelling from other parts of Australia. This is to prevent fruit fly from damaging the citrus-growing industries of either state. Once again, we arrive at our destination in time for tea. But instead of stuffing our faces with hot chips from the one and only café in Eucla, we check out the pool for houseguests and picturesque gardens, which the hotel’s restaurant looks out onto. From our hotel room you can catch a glimpse of the sea. It’s not the Ritz-Carlton or the Shangrila, but it is clean and comfortable. A picture of our room in Eucla, Western Australia. You can catch a glimpse of the sea. A picture of the view from our room in Eucla, Western Australia. Trying to walk to the beach; never got there as it was a lot further than what it seemed from our room window. A picture of father and daughter moseying down the rocky path in Eucla, Western Australia. A picture of a giant whale in the kids playground at Eucla, Western Australia. So far from civilisation. A picture of HRH and Amanda at the “Traveller’s Cross” in Eucla, Western Australia. Can you see the sliver of sea in this photo? It’s a different blue to the sky. The restaurant looks out onto this gorgeous garden. You’d appreciate the effort it takes to establish and maintain such a garden if you saw the hard, clay-like soil. A picture of the gardens at our hotel in Eucla, Western Australia. Amanda wanted spaghetti even for her birthday.